Brake tools from JW Pickavant. Homepage. This page: Tools designed to help with the maintenance of car braking systems in the 1930s - 1960's. The fold-out leaflet shown below harks back to the mid-1960's, to a simpler time when cars were relatively straightforward to work on, and a basic kit of tools could be utilised on most cars likely to grace a typical garage's workshop. The name Pickavant - or rather Sykes Pickavant - is still synonymous with motoring tools and diagnostic equipment. This leaflet was picked up at J.W. Pickavant's stand at a Motor Show in the '60s, and within its folded pages is an introduction to brake pipe flaring tools, benders, brake adjusting spanners and other essential bits of kit. 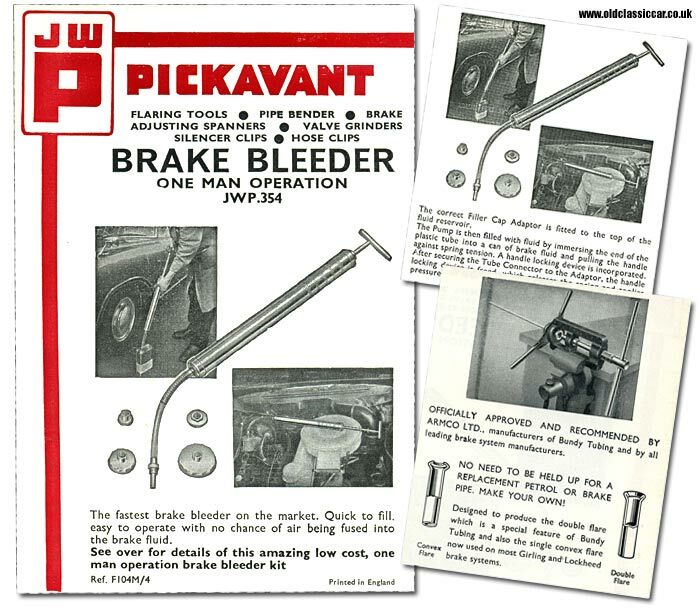 The cover shows a chap in overalls demonstrating the one-man brake bleeder - "the fastest brake bleeder on the market - quick to fill - easy to operate with no chance of air being fused into the brake fluid". Four adapters were included in the kit, one of which would be fitted to the car's brake master cylinder. The pump would be filled with fluid by immersing the flexible plastic tube into a can of brake fluid, and the handle pulled back, then locked into position. The pick-up tube would then be connected to the adapter on the master cylinder, and the fluid forced through the system. The capacity of the pump - 8oz - was sufficient for all cars we're told, and meant that no pedal pumping was required. So long as you were careful not to drip any fluid onto the car's paintwork, this must have been a useful piece of equipment. Are they still available? Nowadays, pressure bleeders seem to rely on pressure from a compressor or spare tyre, but this looks like a handy alternative to that. Pickavant could also supply the other tools that garages would often use when servicing a car's braking system. Flaring and pipe-bending tools would be essential if repairing corroded brake lines, and both convex and double flares could be accomodated. Non-brake tools include suction valve grinders, and special hubcap removers. Found tucked away within a trade publication from 1948 is this next handy example of J.W. Pickavant kit, designed - and priced - with trade rather than private buyers in mind. 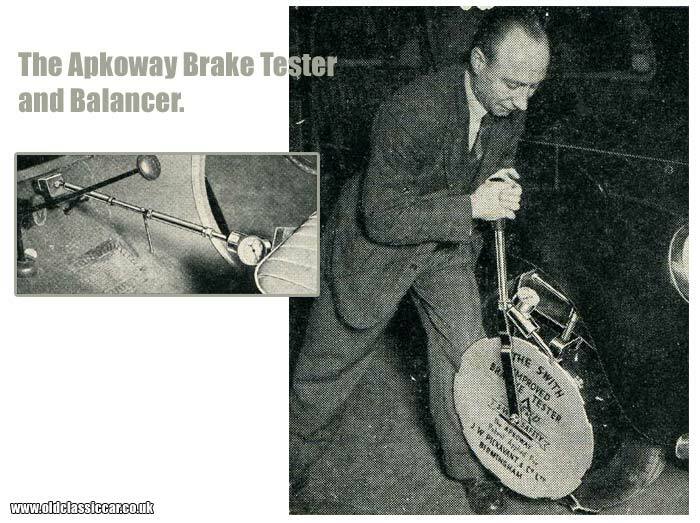 The "Apkoway" brake tester and balancer comprised two main units - one being the wheel clamp, the other being the hydraulically-operated foot pedal depressor. The depressor was placed on the brake pedal, and pumped out to replicate the action of a driver's foot on the pedal, the pressure being recorded on the built-in gauge. With the pedal hard down, the lever attached to the wheel clamp would be rotated by the garage operative, the gauge recording the amount of pressure - and therefore the effectiveness (or otherwise) - of the brake, at that corner of the car. Prices for the Apkoway brake tester started at £27 10s 0d, upto £42 17s 6d. Not only were the cars brakes tested in this way, the secure mounting of the driver's seat (and the condition of the floor to which it was attached) also received a test. At a time when cars were being resurrected after the war, and in the day's before the 10-Year Test (MOT), crumbling floorpans and non-existent brakes were not all that uncommon. Other similar tools in this section include the Ferodo/Tapley brake efficiency tester, and the drive-on Weaver brake tester.